Going through the #SheHeals challenge did change me. It changed my outlook on life. I had to dig deep to exhume the skeletons that were buried deep within. By answering the questions, I was provoked to discuss issues that I wouldn’t have otherwise. These questions look simple and repetitive but when you take the time to go through them you’ll understand the point of the exercise. They ask pivotal questions that you should be thinking about. All the things that I came to unearth during this journey were always there just didn’t know how to deal with them. I wasn’t sure which of the issues I had to deal with. I had to be honest. Honest about issues I had lied to myself about for years just to ease the pain. You know exactly what I am talking about. Things that bring you pain and shame and so you pretend they didn’t happen or alter the way that they happened so that they don’t hurt as much. I had to air out all the dirty laundry. Unfortunately, #SheHeals isn’t a life reset button but it has changed me in ways that really matter. It has altered the way my mind works. I am more aware of the glitches in my system and now I actively try to overturn the negative thoughts that try to pollute my mind. For example, when a situation starts to drag me to a dark corner, I counter the dark thoughts with positive affirmations and thoughts of gratitude. The challenge came at a great time when I was at a turning point in my life. 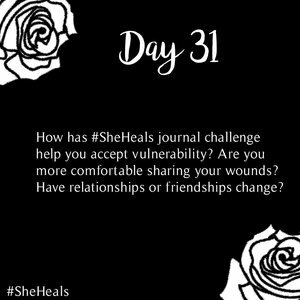 #SheHeals in conjunction with my spiritual purge have birthed a new me and I’m excited to get to know her. She’s showing a lot of promise.